In last Sunday’s post, see here, I mentioned jewellery-making classes I went to many years ago. 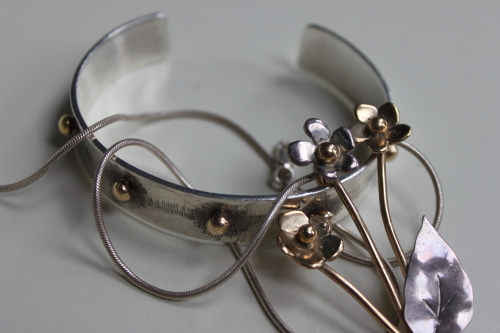 I made quite a few things including the bracelet and flower necklace in the picture; because they were on my mind, I have worn the pieces a lot this week. They are many degrees short of perfection but are still wearable. Of all the courses I have attended, jewellery-making one that I found easiest to master; at the end of the first evening I came home with a very simple silver cross that I had made. The process was straightforward, I sawed out the cross shape, I then filed the edges smooth and it was finished when the teacher soldered on a ring, to thread a chain through. So if you are looking for a spare time creative outlet maybe jewellery making might be for you. 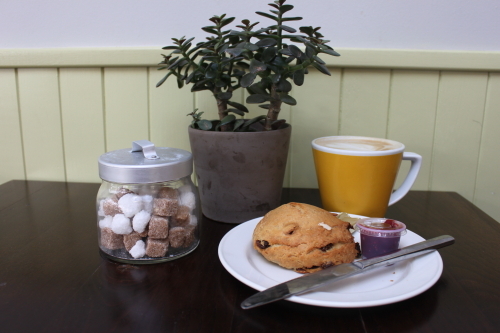 Saturday morning signalled the end of my five days of detoxing, so I was able to stop, en route to work, to have a buttermilk scone and a latte for breakfast. Every time I do some form of detox, I swear afterwards that I will cut back on my coffee intake. My current resolution is to stick to one a day, so far I am on track, hopefully that isn’t just because I am aware that having cut it out for almost a week it’s not a good idea to over indulge on caffeine. Let’s see how it goes. I am always fascinated by the way connections click in my brain to piqué my interest in something. I eat occasionally in a restaurant in Dun Laoghaire (South Dublin suburb) called Alexis; it’s named after a Frenchman Alexis Soyer (1810 – 1858) a chef (possibly the first celebrity one), writer of cookery books, inventor and humanitarian. When I was flicking through my copy of Elizabeth David’s French Country Cooking I came across a recipe for Potatoes in Papillotes, which I cooked this weekend. The connection is that Elizabeth David mentions in the recipe that it was Nicolas Soyer, Alexis’s grandson who perfected the system of paper-bag cookery and published a book about in 1911. Here are her directions for paper-bag-potatoes. “Scrape 24 very small new potatoes. 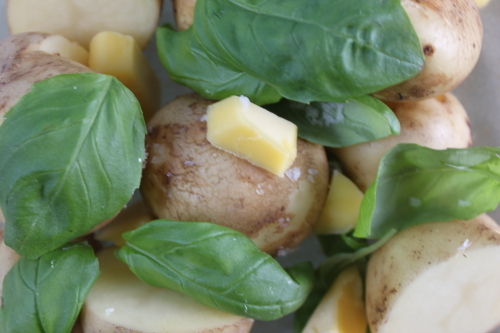 Put them on a fair-sized piece of greaseproof paper, with 2 leaves of mint, a little salt and 2 oz of butter. Fold the paper over and then fold down the two edges so that the bag is completely sealed. Put it into a pre-heated oven, on to the grid (Gas 5), and cook for about 35 minutes”. As I didn’t have any mint, I used basil and many more leaves than two. I found that I had to cook the potatoes for more than thirty-five minutes, even though I cut my large potatoes in half but that may be because my oven is temperamental. Gas mark five is 190° C.
Update; I came across another a recipe for potatoes in parchment paper which also suggests a cooking time of thirty five minutes but recommends cutting the potatoes into one inch pieces unless they are very tiny.